Parameters supply additional information and functionality for the presentation of certain files. In the Experiment Editor, all parameters are optional but offer the user some nice flexibility. Parameters can be given in any order, must be separated by commas, and the entire set must be enclosed in a single set of parentheses. Note that parameters also can be set for background, backsound, and backvideo files following the same rules except that their parameters are entered after the filename used in that field rather than in the Parameter(s) field. placing your particular arguments in place of myarguments. This window shows you exactly where the top left pixel of your image will be placed. The top and left pixel values are marked every hunderd pixels along the top and left borders, respectively. 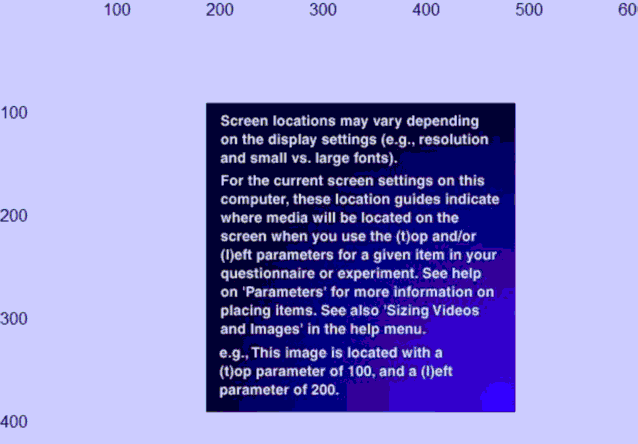 into the Parameter(s) field would display a rectangle 30 percent of the screen's width and 25 percent of its height. into the Parameter(s) field for a video that is normally 320x240, it will appear as 200x150. into the Parameter(s) field for that first questionnaire file. in the Parameter(s) field will put 300 seconds on the clock. Note that you can place a single item in a Questionnaire File in order to get the countdown timer with a single item. IMPORTANT: If you are using a countdown timer for in an Experiment File, try to avoid using duration parameters on items within any Questionnaire File in that same line of the Experiment File that could conflict with your countdown (e.g., using the same number of seconds in the d parameters for the questionnaire in the experiment file and an item in that same questionnaire file).